Gorgeous red birds eye chillies and some fresh zucchini in the the weeks vegetable supply, set me to searching for the perfect ‘winter’ soup. 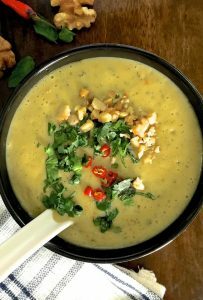 Broadly adapted from Simply Recipes ‘Spicy Zucchini Soup’, the curried chilli zucchini soup with grated zucchini and with walnuts and turmeric, is one treat you will come back to again and again. The varied textures and balance of flavours are everything one would want a soup to be.